When she was first hired to work on this rustic house in bucolic Woodside, California, interior designer Mary Jo Fiorella helped eliminate some of the rough edges. While she left the home's redwood timbers exposed, she smoothed out clay walls and gave the rest of the home a more orderly and cohesive appearance. After the owners built an extremely contemporary master suite, Fiorella returned. This time, ironically, to do the reverse: add character and texture to the sleek new rooms so they flowed more naturally with the other spaces in the house. In the new master bathroom, the designer struck a balance between clean, contemporary lines and organic elements inspired by the surroundings. 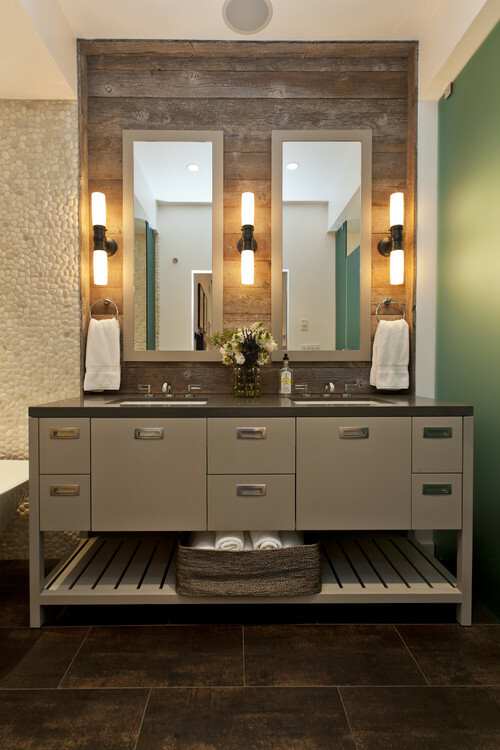 She mixed materials like frosted glass panels with reclaimed barn wood, and sleek hardware with pebbled walls. While we don't typically think of a master bathroom as the heart of the home, Fiorella's design intervention has made the small space a favorite spot for the entire young family of five. "I needed to carry the materials from the original part of the house through to the addition," Fiorella says. Inspired by the beams and timbers in other rooms, she brought in coarse reclaimed barn wood. 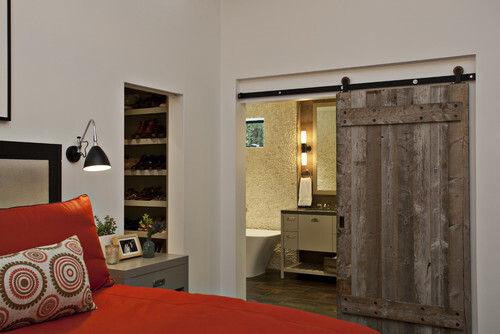 A custom barn door hints at what's beyond in the master bathroom and adds primitive character to both rooms. A black iron track punctuates the top of the doorway. The vanity is modern yet warm. "I custom designed it to look like a piece of furniture; it's open and not a solid piece," Fiorella says. She accentuated the vanity area by paneling the wall behind it with reclaimed barn wood that extends all the way to the ceiling. The wood introduces a warm, rough-hewn texture that contrasts with the vanity's sleek recessed drawer pulls and modern custom mirrors. To protect the wood, Fiorella sealed it with a matte marine-grade polyurethane that will stand up to splashes and steam. There are also frosted glass panels on either side of the vanity. The one on the left (seen in the next photo) is a little scrim that creates a slash of separation from the open shower and plays off the panel seen here on the right, which includes a hinged frosted glass door that encloses the toilet compartment. In addition to the mix of textures, she used soft colors such as taupes, tans, browns and metallics to warm up the space. The floor tile has a weathered metal look that includes copper tones; it ties all the parts of the bathroom together. Laying out the bathroom to include a soaking tub and a large shower was no easy feat. Fiorella went through four or five iterations before declaring, "It's OK for a tub to get wet!" Keeping the two together inside a walk-in curbless shower, rather than chopping out a separate shower stall, allowed for a much more open space. 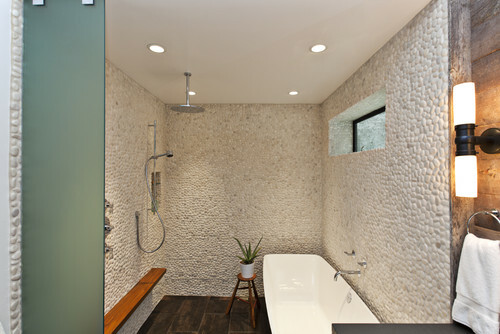 The pebble tile walls connect the space to the surroundings and add a delightful layer of nature-inspired texture. The metallic colors in the tile floor provide a strong contrast to the light-colored pebbles. A teak shelf stands up to the moisture and keeps shampoo, soap and other bath products handy. A second handheld showerhead makes bathing the kiddos a breeze. In fact, the shower area has become a family favorite; the little ones adore showering here with a parent. "The whole family loves the shower room," says Fiorella. "One year their Christmas card was a photograph of them in here."